Apple iPod Touch 32GB Pink Media Player Copyright © 2019 ComXpert International CC - COPYING IS ONLY ALLOWED FOR THE PURPOSE OF SENDING US ENQUIRIES. E&OE. Your music. Wherever you go. iPod touch features an Apple-designed A8 chip built on 64-bit architecture. This desktop-class chip features GPU performance up to 10 times faster than the previous-generation iPod touch — so the graphics in your favorite games are more responsive and look more vivid than ever before — and CPU performance is up to six times faster. And you get the same great battery life, with up to 40 hours of music and 8 hours of video playback. You’ve got a great eye. See what you can do with even better cameras. With exposure control, the FaceTime camera lets you lighten or darken your photos and videos with a simple nudge. The same exposure control is also on the rear-facing camera. The world’s most advanced mobile operating system. iOS 11 sets a new standard — making iPod touch more intelligent and personal than ever. Discover new music with friends, take great photos and videos, and send more expressive messages with stickers, games, and apps. iPod touch comes with iOS 11 and a collection of powerful built-in apps. Send unlimited texts with iMessage over Wi-Fi. See your friend’s every expression with a FaceTime video call. Post a photo directly to Facebook or Twitter. Or browse your favorite sites with Safari. Wherever your music comes from, everything you’ve collected from the iTunes Store and beyond lives in one place. And with an Apple Music membership, your collection sits alongside the ever-growing Apple Music library. It’s like having just about every song ever recorded at your fingertips. With the FaceTime HD camera, you can take your best selfies and group shots, and make video or audio calls over Wi-Fi to an iPod touch, iPhone, iPad, or Mac. Compete with friends in this social word game that mixes spelling with territorial control. Players take turns using the letters on the board to spell words and convert tiles into their color. Now up to six family members can share purchases from iTunes, iBooks, and the App Store without sharing accounts. So you can give your favorite people access to all your favorite things. Family Sharing makes it easy for family members to share photo albums, calendars, and even their location. You can even create Apple IDs for children under 13 years old so they can participate, too. Parents can require children to ask permission before making purchases, as well as limit which websites can be accessed in Safari. © 2018 Respective owners and brand holders. This table has been carefully researched and generated by ComXpert International CC (//www.comx-computers.co.za), however, errors and omissions may occur. Only references to South Africa apply. All products are sourced in South Africa from the official suppliers and the warranty is that of the local supplier. E&OE. This table and our site's content may be used on condition that this notice and link remains intact and unaltered. iOS 11 sets a new standard for the world's most advanced mobile operating system, making iPod touch more intelligent, personal and expressive than ever. Built-in Apps Built-in apps are an essential part of your iPod touch experience and are efficiently designed to use less than 200MB of storage. , ©2018 ComXpert International CC Copyright © 2019 ComXpert International CC - COPYING IS ONLY ALLOWED FOR THE PURPOSE OF SENDING US ENQUIRIES. E&OE. The best price and guaranteed service and backup from official computer suppliers in South Africa for the MKHQ2 Apple iPod Touch 32GB Pink Media Player. The Apple MKHQ2 Apple iPod Touch 32GB Pink Media Player is available for R4030. The product is sold by ComX Computers as new. Prices are valid today 2019-04-22 (before 2019-04-23 , by quote, while stocks last). The product is expected to be in stock, although this is not guaranteed. 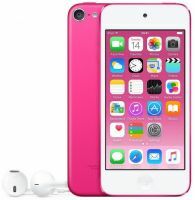 Find related MKHQ2 Apple iPod Touch 32GB Pink Media Player products in our MP3 WMA audio players Category for even more options. Read reviews and find out about MKHQ2 Apple iPod Touch 32GB Pink Media Player. Discounts, specials and cheap prices only at ComX Computers.